The princess and I got invited to Elijah's Birthday Party last August 15, 2015. He is the son of the very pretty Mommy Blogger Rochelle of rochellerivera.com. I happen to have the same birthday as Elijah so it felt like celebrating my birthday too, hehe. Attendees were asked to come in a superhero costume for the boys and a fairy costume for the girls. 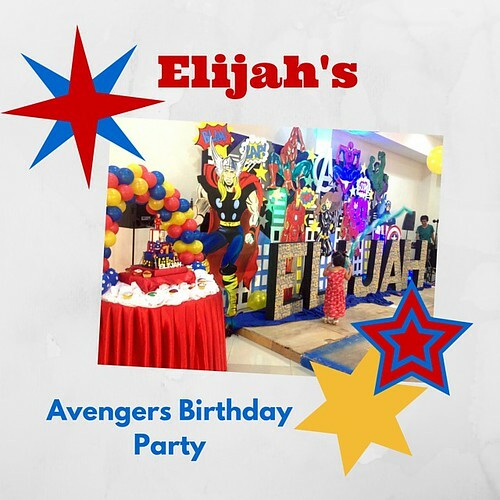 The party was held at the RGI Corporate Center and it was the ideal place for the wonderful set up of Elijah's Birthday. The whole Rivera family was dressed as superheroes and because my princess wasn't in the mood to party, I wasn't able to get nearer to take a photo. Elijah was dressed as Iron Man and Rochelle was Black Widow, they all looked amazing! The party was hosted by the multi talented Albert Curesma, who was so great with the kids when it came to games. Talk about an all-around talent, he was the host, the balloon artist, the magician and the puppeteer for the entire event! My princess squealed with delight when he gave one of his balloon creations to her. I loved the set up of the party since the kid's food was directly served at the tables so that gave the parents the time to get their own food from the buffet without hassle, I loved the desert table by Ella's Bakeshop. Rochelle had also prepared a raffle for everyone and you can tell that everyone who attended was so happy. Posted the individual photo because she was crying in the other shots, hahaha. Kids went home with a wooden stool created by Wooden Kiddie Stools and the princess was so happy since she got the Hello Kitty Stool. Iron Man for the boys, Hello Kitty for the girls! Thank you sis Rochelle for having us over and also for giving me the time to get a photo with you hahaha (lakas maka fan lang).